The last Uber has left the building. After letting Uber know I wanted to turn my phone in because I’m not paying $10/week to rent their phone and because they refuse to pay me correctly…. (and let’s be honest, I do Lyft only these days because it’s way more fun, and they don’t f*ck their drivers at every turn) and I don’t like the crap they pull on their drivers. 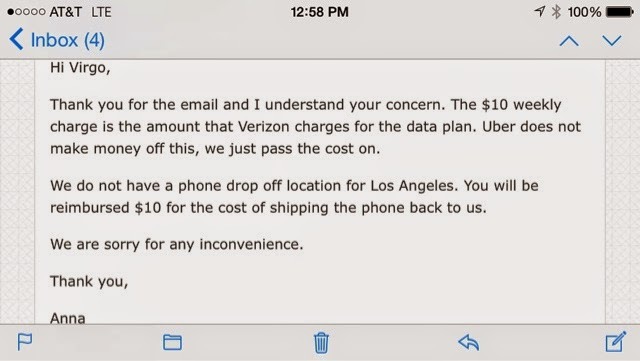 And this is the email I get back… pay attention- this dumb Uber b*tch thinks my phone is Verizon. She should be first in line for demotion based solely on her sTupiTidy.